Ahoy there! Fronted by parents and product designers (who also dreamed-up a moustache mobile! ), Jäll & Tofta created this over-sized blanket for pirates, sailors, or anyone who craves the life aquatic. The lush and fluffy Aye-Aye Decke blanket is designed and made in Germany from 100% GOTS-certified organic cotton. The design on the blanket travels from rolling waves in two colors on a soft, white background to a pattern created to resemble the wooden deck on a ship. Use the Aye-Aye blanket over a toddler bed or a table or a couch to recreate a journey across the seas without setting sail from the comfort of home! Ahoy there! Fronted by parents and product designers (who also dreamed-up a moustache mobile! 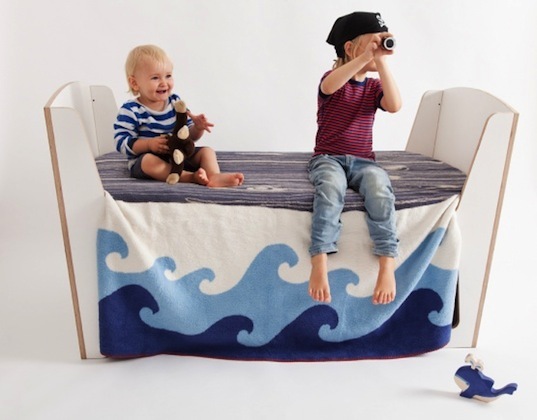 ), J�ll & Tofta created this over-sized blanket for pirates, sailors, or anyone who craves the life aquatic. The lush and fluffy Aye-Aye Decke blanket is designed and made in Germany from 100% GOTS-certified organic cotton. The design on the blanket travels from rolling waves in two colors on a soft, white background to a pattern created to resemble the wooden deck on a ship. Use the Aye-Aye blanket over a toddler bed or a table or a couch to recreate a journey across the seas without setting sail from the comfort of home!